Doesn’t those ‘tube-like’ red things look darn interesting? I think they’re rather unique. Those are Shish Kebabs ($13) by the way. It’s made out of lamb. Though the colour might look a tad too unnatural, it tasted all right. Not as delicious as I would have expected ‘tender lamb’ (well that was what the menu stated!) to be. It looked very ‘manufactured’. Anyways, in case you were wondering, the kebabs are from Dharma’s Kebabs down at Boat Quay. Went there for dinner with fellow local food blogger Julia of Aroma Cookery. It was the first time meeting her but i’d say we hit it off right away. I do think that it’s definitely because of our interest in food. We actually didn’t know where to dine (hey don’t blame us, there are just too many eateries in S’pore!) so I suggested Dharma’s because I’ve heard about the place and well they were featured in a few magazines. Besides, Julia has never eaten there before, and me neither so kebabs it was. 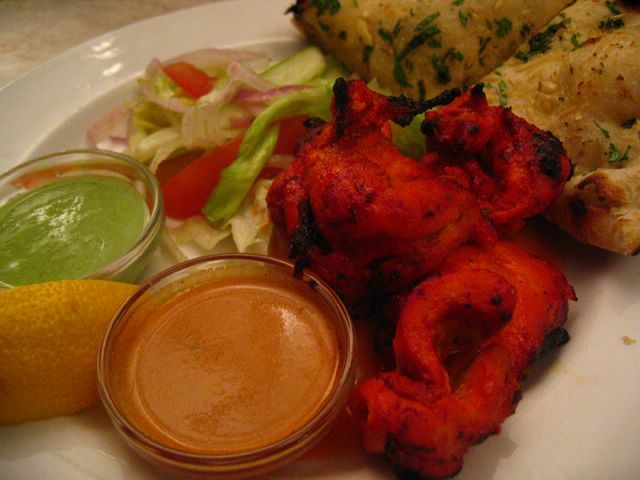 This one here is chicken tikka ($14). I got to admit that I prefer the tikka more than the shish kebabs. somehow it was in it’s natural form which I could recognise and I liked how they marinated it. The sauces were a definite shoo-in. The orange-brown one there is actually curry, albeit a little thin. The green one there is actually mint sauce. 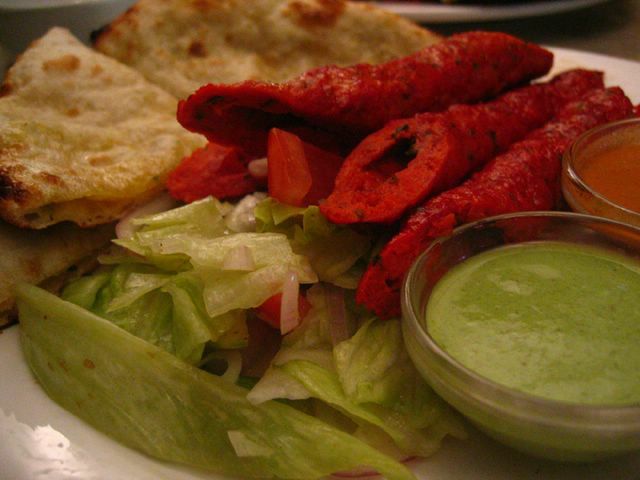 Good combination of sauces… allows diners to choose the spicy or non spicy route. Well and it was to no surprise that i lapped up all the sauces. Ahh and then there’s the flat bread. Those were wonderful breads i must say. The one that came with the shish kebabs were stuffed with potato (yes, you guys know how much i love potatoes!) and they served the garlic one with the tikka. Both flat breads had a very soft fluffy texture to them and it was lovely to tear up and put them slowly into my mouth. I think this has got to be one of the better flat breads i’ve tasted. Thumbs up for the bread! Tastes great with the sauces too. Well all in all I would say the food at Dharma’s was reasonably yummy. Maybe we should have ordered the beef tenderloin (heard lots about it) or maybe even the mixed platter which has an array of meat. Thing is, there was only the two of us and i doubt we can finish so much food… So maybe i’ll drop by next time to try out the other stuff… The wedges look good too… we saw many diners ordering that. After we were done with our dinner, it was time for…. yes dessert! my most favourite part of a meal. That’s the Coeur Noir ($5.20)! I chose that after standing for quite some time at the display casing. Yes yes, i can be quite fickle…. Seeing that Bakerzin has plenty of good quality desserts. In case you didn’t know, i’m a HUGE fan of Bakerzin and have tried almost ALL of their desserts. I even have their ‘PURE INDULGENCE’ member card! 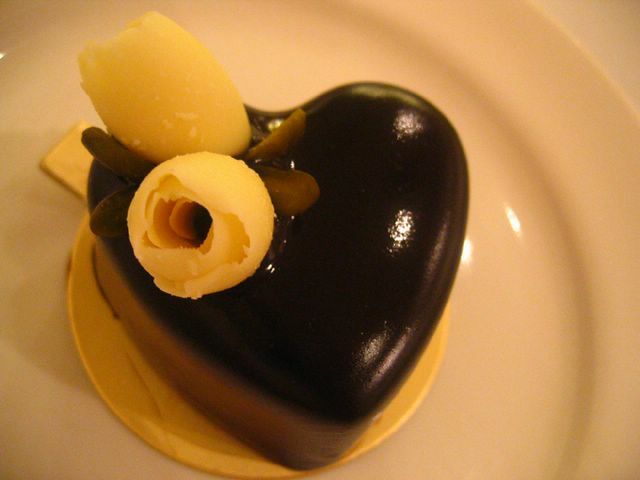 okay as I was saying, i finally chose this little heart shaped dark chocolate mousse dessert. It was such a pretty thing that i couldn’t bear to poke my fork into it. I spent quite a great deal of time admiring it. But i knew i couldn’t just sit and stare at it for the rest of the night, so i dived in and man, there was no need for words. My eyes expressed it. I was on cloud 9. I adore dark chocolate and this coeur noir was definitely down my lane. It not only looked good but tasted good as well. 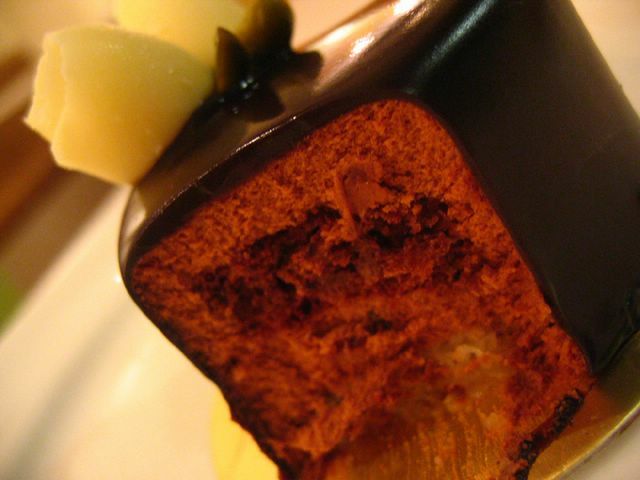 Here’s a description of it taken off the Bakerzin website: “Layers of dark chocolate mousse and sacher sponge, with brandy cherries and hazelnut dacquoise at the base”. Yummy. If only they had a bigger sized one. I know I would be able to finish it! This has got to be my all time favourite dessert. 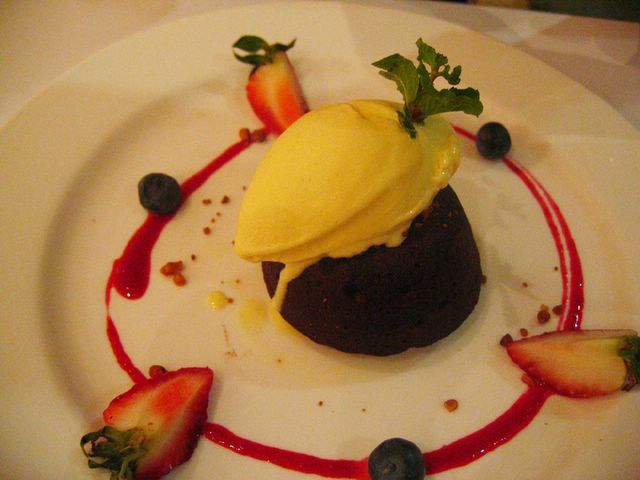 This Warm Chocolate Cake ($9.50) is a must-try. Anyone who dines at Bakerzin has to try this. I managed to convince Julia to order this. She was actually deciding between this and the chocolate souffle but the voice in me told her ‘order the warm chocolate cake, go ahead, you won’t regret!”… and the rest, as they say is history. I do believe she’s now a convert… am I right Julia? You should have seen both our faces when our tongues made contact with the brown morsels dripping with real vanilla bean ice cream. It was pure ecstasy. I got to tell you, I could get high on warm chocolate cake, believe me. We were walking on air for that instant. It’s a brilliant dessert and well I shouldn’t hard sell it too much… You should simply trust your instincts, follow your heart and head down to Bakerzin to get one yourself! =) and tell me about it. I trust that you’ll love it. Well if you don’t, then you can redeem some chocolate chip cookies from me. Deal? Food looks so good! And I will make sure I go to Bakerzin once I get there. Just thought I’d drop you a line saying I’m sorry I haven’t replied your email yet. I have two exams on Tues & Thurs next week, so I’m swamped with work and last minute cramming (the usual). yes yes, and then we could go together and go ga-ga over the array of cakes!